Laurie Here - Contemporary Fiction and MORE - Book Reviews: “Winter in Full Bloom" by Anita Higman - REVIEW - AND Kindle Fire HD Giveaway and Facebook Party! “Winter in Full Bloom" by Anita Higman - REVIEW - AND Kindle Fire HD Giveaway and Facebook Party! This is one of the books I found in the Book Buzz 2013 book! Yes! Another one! I read a few chapters in that book out of this book and HAD to request it! Then, I got an email from LitFuse Publicity saying it is on TOUR! I entered my info hoping to get into the tour for this book, and I got in! I am SO HAPPY! I have read a lot of Anita Higman's books, and you can suffice it to say that if she wrote a book, you are going to want to read it and you'll love it. Her books are excellent! They are beautifully written and I would pick any Anita Higman book up in a second, and this NEW one is no different! With this being Christian Fiction, and what I love about Anita Higman's writing in this genre is the religion is not forced down your throat like it can be sometimes. It is very beautiful the way the character has a personal relationship with God, and she talks to God as if in conversation with Him. I probably really like this because it was the way I was taught. She also prays, of course, and it's all done in a very nice way. This book is not preaching to you to drop what you're doing and run to a church to go save yourself. This is why I probably really like reading this author's books. The religion is there, and it's expected, you notice it, but it's not overboard, just the right kind and amount. This book starts off with Lily on a plane for the first time practically having a nervous breakdown! This was her first flight. It was so cute as there was a little girl chewing gum and blowing big, purple bubbles, but was wise well beyond her years in age helping Lily try to relax and calm her nerves about the plane ride. This little girl knew all the symptoms of a first timer on a plane! She even knew what a panic attack was! It was a hoot! So why was she on a plane? Allow me to officially introduce you to Lily Winter, 39, widowed, and now an empty-nester as her daughter, Julie, has gone away to college. Lily gets beckoned from her evil mother to come over to her house. It had been 10 years since Lily last saw her mother. (Her mother is a mean piece of work!) Her mother proceeds to inform Lily that she has a twin sister, Camille, who lives in Australia. This was quite a secret kept from her until now. It was never really revealed why the mother waited until she did to tell Lily about her sister. Heck, her mother could have taken that secret to her grave. She was told they were separated when they were one year old. Since Lily never knew she had a twin sister, she had to go search for her immediately, of course, and that takes us to Australia. An interesting thing to note here is her mother had a few mustard seeds on the coffee table. Was that reaching out? If so, then why was she still so mean! For instance, she was so mean, she had to pay someone to be her friend! So, Lily takes a leave of absence from her job and flies to Melbourne, Australia, to go find her twin sister, Camille. When she gets there, she ends up meeting a man named Marcus, Australian accent and everything, but originally from Dallas, close to Lily's home, but he had no plans on moving back to Texas. (I had a hard time buying this one. You travel around the world to the opposite side of the globe and end up meeting someone who is originally from where you live?) He helped Lily look for Camille, and in between they fall in love, so there is another storyline there, yet the focus is still on the search for her sister. I had difficulty with that romance. How can you focus on finding the twin sister you never knew you even had, yet date a man you just met at the same time? I felt this a little odd, but I guess it worked because I connected with the two of them. If I were in that situation, the only thing I could be concentrating on is finding my sister, and once I did, that's the only person I would be with, not a man I just met. This book is about forgiveness. During the last third of the book there were some more things I could not see being realistic in life, so I had a hard time with that part of the book, too. I can't explain it in the review without giving away spoilers, so I'm going to have to avoid that, but it didn't work for me. Maybe the romance, again, or perhaps the other characters? The other characters were nowhere as well developed as Lily and Marcus were, yet we are asked to and I could not. I almost did, but other things happened which pushed me further away rather than closer because in real life . . . I tried to ignore it because this is fiction, after all. Despite that, Anita Higman's writing is always so beautiful, the way she describes things can catch you off guard as they are so descriptive. At times you are just in awe as she uses such beautifully descriptive words to describe a mundane thing and can bring it to life, that you can get lost in her writing! In this 'one' book though, I found at times it did take away from my reading experience a few times where in the past it has not. I would be reading and getting lost in the description and I would then forget what Lily was doing or talking about prior to the description. That has not happened to me in the past with Higman's writing. The title sure is different, yet the cover - WOW! Gorgeous! When it is summer here, (as Lily is from Texas) it is Winter in Australia! They blended the two to make the cover and hit that and the name of the book SPOT ON! Amazing! Absolutely beautiful, huh! Wow! You WANT to read this book! Even though I had a few problems with this book as mentioned above, I would still HIGHLY recommend reading this book. We all get something different out of a book, so you may get something quite different than I did. Grab your copy today and see what you think! Heck, it's Anita Higman! I received this book for FREE from River North Publishers and LitFuse Publicity in exchange to read and write a review about it. It is NOT required for this review to be either positive or negative, but of my own honest opinion. "Free" means I was provided with ZERO MONIES to read this book nor to write this review, but to enjoy the pure pleasure of reading it. I am disclosing this information in accordance with the Federal Trade Commission's 16 CFR, Part 255, http://www.access.gpo.gov/nara/cfr/waisidx_03/16cfr255_03.html Guides Concerning the Use of Endorsements and Testimonials in Advertising. 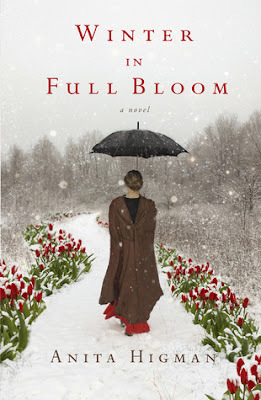 Anita Higman's latest novel, Winter in Full Bloom, has just released. She's teamed up with her publisher, River North Fiction, for a fun giveaway (LAST DAY TO ENTER IS 8-28) and a Facebook Author Chat Party on August 29th. Enter today by clicking one of the icons below. But hurry, the giveaway ends on August 28th. Winner will be announced August 29th at the Winter in Full Bloom Author Chat Party on Facebook. During the party Anita will be hosting a book chat, talking about family, announcing the winner of the Kindle Fire, and giving away a ton of books, gift certificates, and more. Oh, and she'll also be giving party goers an exclusive look at her next book.